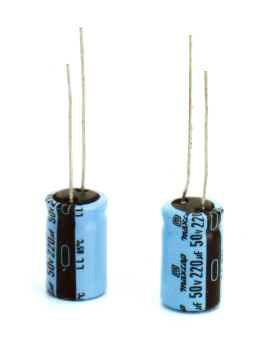 Leakage Current Rated DC working voltage shall be applied to the capacitor in series with protective resistor of 1000. The leakage current shall not exceed the following valeues after 1 minute at 20°C. Load Life The following specification shall be satisfied when the capacitors are restored to 20°C after the rated working voltage is applied for 3000 hours at 85°C. of 30 minutes, at least 24 hours and not more than 48 hours before the measurements. After exposing the capacitors at room temperature for 6 months without applying any voltage, capacitance DF shall meet the initial specified value and leakge current shall not exceed 150% of the initial specified value. L' L + 1.0 L + 1.5 max. L + 2.0 max. ØD' ØD + 0.5 max.